Today's companies that train diabetic alert dogs and place them with families have experienced a high rate of success, but there's a catch—nobody knows how the dogs are doing it. That's where Catherine Reeve comes in. Currently in her fourth year of the experimental psychology PhD program at Dal, Reeve has launched one of the first studies of its kind on diabetic alert dogs. 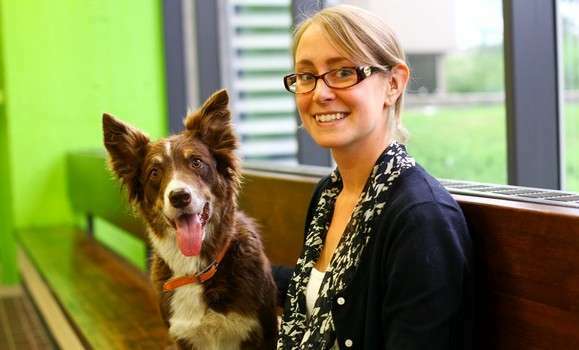 The basis of her research is exploring if dogs can detect changes in the blood sugar of people with diabetes, and how it's done. "That, along with cancer detection dogs and medical detection in general, is just now becoming a field of research. It's very promising and that's why it's very interesting," Reeve says. "There have been very few studies done with cancer detection and dogs, but the ones that are out there, the dogs are extremely accurate and its extremely impressive. Now it's kind of like, wow—what else can they do?" After completing her undergraduate and master's degrees outside of Nova Scotia, Reeve decided to move back to Halifax and look at departments that aligned with her interests in animals and behaviour. She found Dr. Simon Gadbois, faculty in the Department of Psychology and Neuroscience at Dal, volunteered in the lab for a year, and applied to the program to begin a project of her own. Four years later, the study has reached a climactic point. "Where we are now is that the dogs are smelling actual biological samples, breath in particular," Reeve says. "We're mostly interested in the lab setting because nobody knows how the dogs do this, and we're working under the assumption that it's a smell. And if it's a smell, then the person shouldn't necessarily have to be in the room. That's the first question that I'm trying to answer." Reeve has been working with four volunteered border collies, Mist, Bella, Nutella and Koda, who have each been trained in the lab for the past 2-3 years. This specific breed was chosen for their high energy, high drive, and stamina to work for extended periods of time. While a lot of breeds are able to do the work, they wouldn't enjoy it the way that a border collie would. Throughout this phase of the study, individuals with diabetes provide the lab with three samples: one when their blood sugar is low, one when their blood sugar is high, and one when their blood sugar is normal. The dogs then sniff along the series of samples and must indicate to Reeve or a member of her team when they find one that's associated with low blood sugar. Data collection will continue for a few more months, but responses thus far have been quite accurate. "While the lab does the research, we should acknowledge the owners of the dog because it really has just as much to do with the owners as it does me. The owners have been bringing their dogs reliably once or twice a week for the past few years," Reeve says. "They've very dedicated as well." For her dissertation, Reeve has about two more months of data collection left. By that point, they will hope to know if dogs are able to pick up on the scent of someone with low blood sugar, and if there is a smell that is consistent across the board with low blood sugar, or if each individual with low blood sugar has a distinct scent. After that, her dissertation will be completed but the project will likely continue. The next phase of the study will have individuals in the lab rather than only biological samples, and Reeve hopes she can be a part of it. "One of my favourite things about doing research in this city is working with Dal's department of Psychology and Neuroscience," Reeve says. "The quality of research is very high."